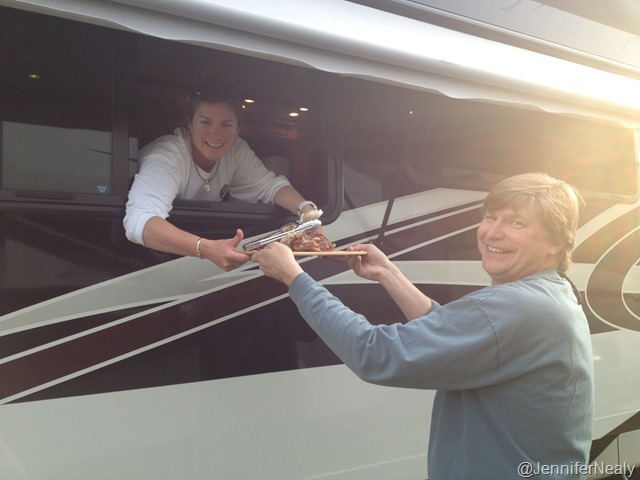 Nealys on Wheels is officially on the road again! 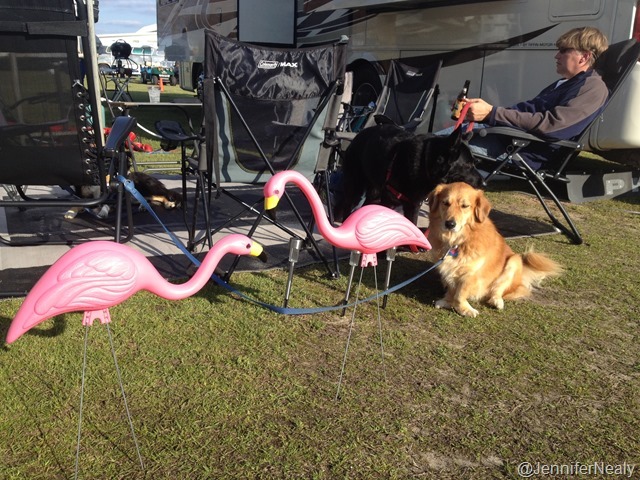 After a fun-filled last week in Florida with our friends, we packed up the RV and rolled out of town early on a Friday morning. We bought a tow car a few weeks ago, so for right now I am following Deas in our other car until we can deposit it at our house in Georgia. It was hard to leave! I’m excited about our trip, but I really, really love where we live. As my dad so perfectly put it, I am very lucky to have found a place that is my spiritual home. And I do consider myself lucky to have found a place to live that I love so much. So even though it was a little bittersweet to leave, I know I’ll be back soon and it just makes me appreciate even more what we have. Our first night’s stop of the trip was at a Harvest Host location. 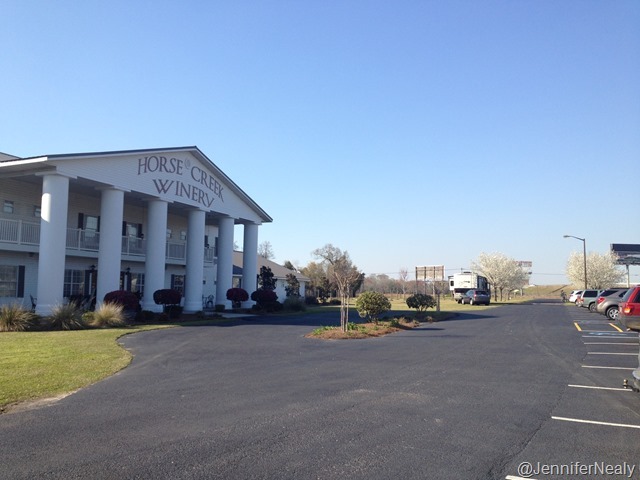 We stayed at the Horse Creek winery in Sparks, GA, and just as with all of our other Harvest Hosts visits, the owners were extremely accommodating. We parked our RV right out front on the grass, had a nice glass of wine on their patio, and enjoyed a good night’s sleep. Not bad for our first night on the road. The next day we had a planned meet with up our friends Nancy & Betsy. We met up with them at a rest area off of I-75, then caravanned to our next stop – the FMCA rally in Perry GA. 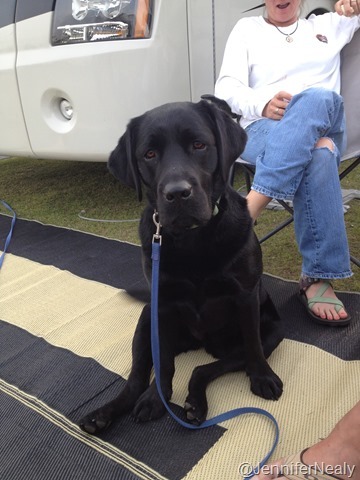 Neither of us have been to a big RV rally before, so we were excited to be able to attend the rally together. 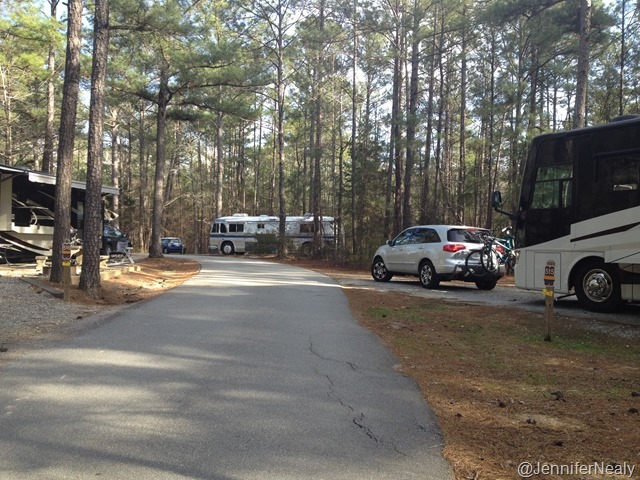 We arrived on Saturday around 1:00, and as expected there was quite a backlog of RVs waiting to be parked. 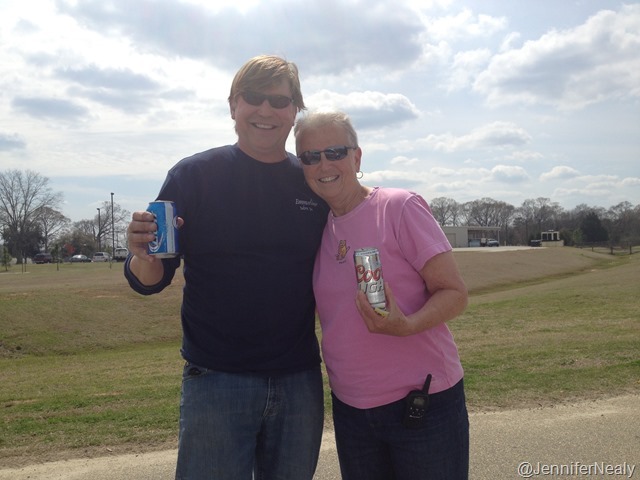 While we were patiently waiting our turn, Deas and Betsy managed to score some free beer from one of the vendors. Our patience slowly began to wear thin, however, as we sat parked on the street for over an hour waiting for a parking assignment. We had both paid for the same type of spot so that we could be parked next to each other, but apparently the lot we were supposed to go to filled up right before we got there, so they were doing some scrambling trying to figure out where to put us. The first spot they proposed was right in the middle of the median on one of the entrance streets, which we weren’t too crazy about. Betsy took charge and had quite a lengthy discussion with the parking chief, whom she apparently dazzled with her charm, because next thing you know, we were given rock-star parking – right up front next to the entrance to the show! No tram service for us, thank you very much! 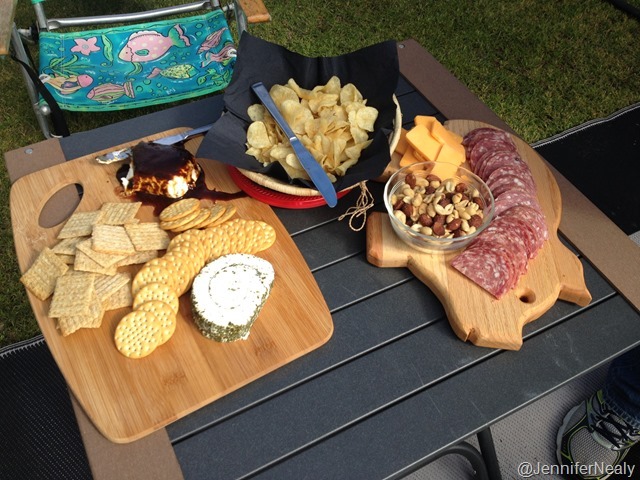 One of the best things about camping with Nancy & Betsy, besides their company of course, is Nancy’s cooking. That girl kept us fed and then some! 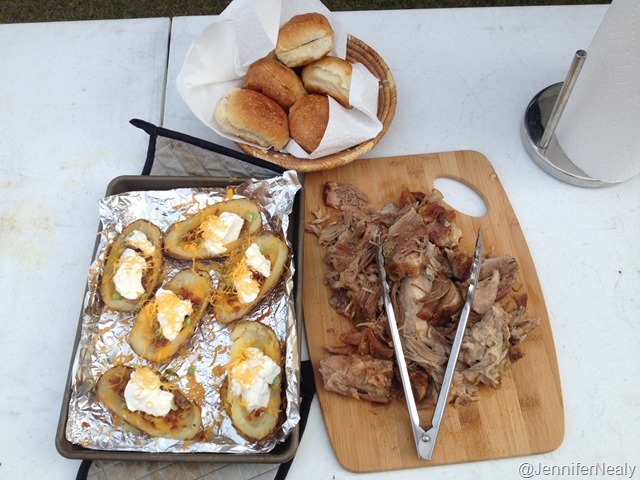 We had delicious dinners of pulled pork, twice baked potatoes, corn on the cob, Caesar salad, and appetizers galore. 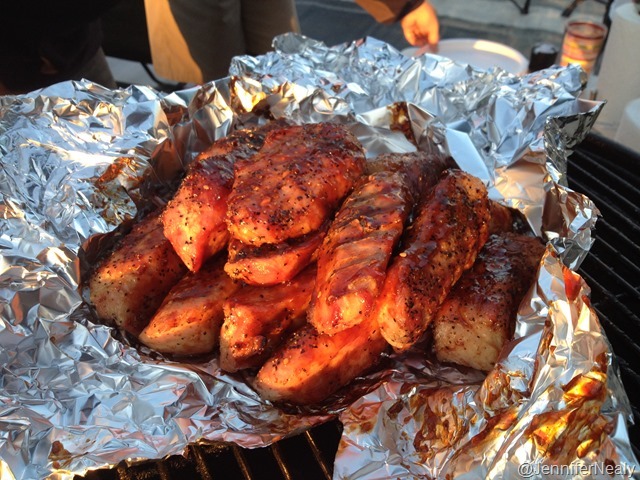 Deas was not to be out done and contributed some delicious BBQ ribs one night. I think I gained 5 pounds this week! And all of the pups had fun too! 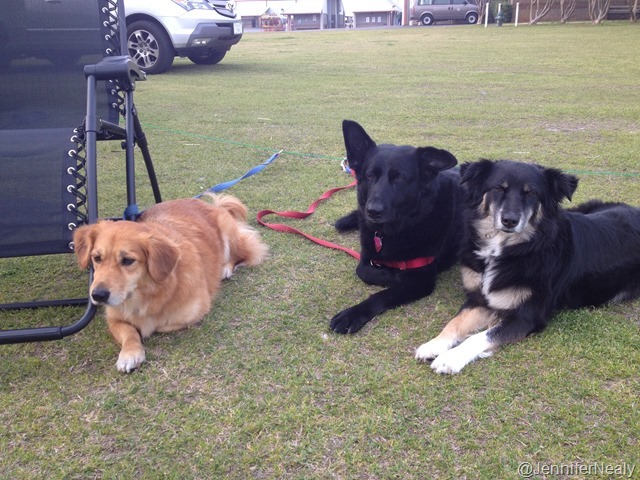 Our three dogs enjoyed having Nancy & Betsy’s cute dog Spirit along for the fun. The FMCA rally in itself was pretty good. Deas, Nancy, and Betsy all attended several seminars, and we bought a few things for the RV: an Oxygenics showerhead, some window awnings, and tire pressure monitors for our tow car. 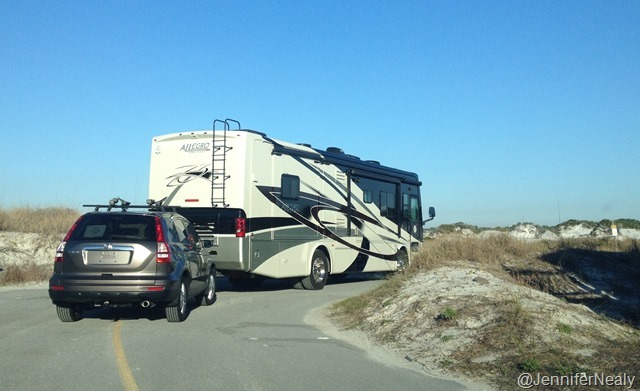 There were almost 3000 RVs in attendance! 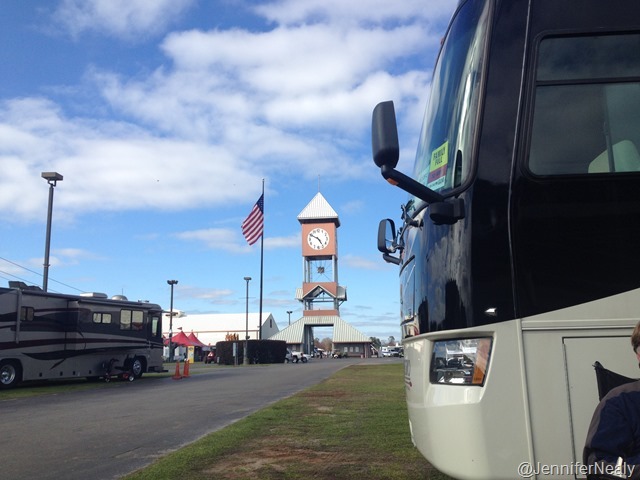 We toured several of the RVs that were for sale, both new and used, and luckily didn’t see anything we liked as much as our current RV. We also got to meet Bob Tiffin at the Tiffin booth. Another added bonus was that our friends Chris & Cherie (Technomadia) were in attendance, so we got to spend some time with them as well. Once the rally was over, we decided we needed more food time with Nancy & Betsy, so we decided to spend a few days with them at the FDR State Park in Pine Mountain, GA. And Chris & Cherie decided to join us too! 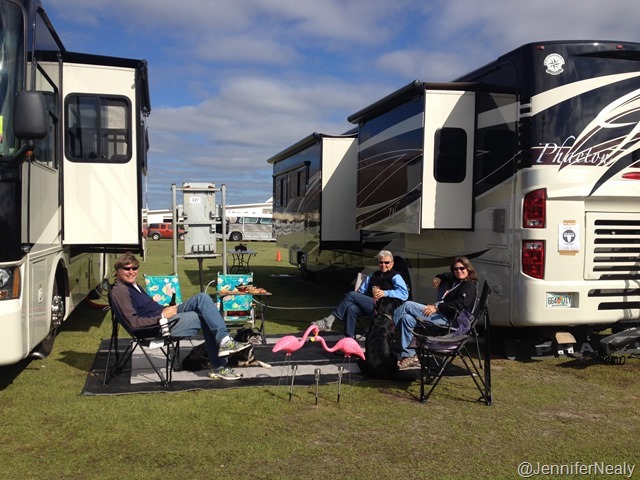 We are all parked next to each other and we’re looking forward to a few more days of fun! Where to next? 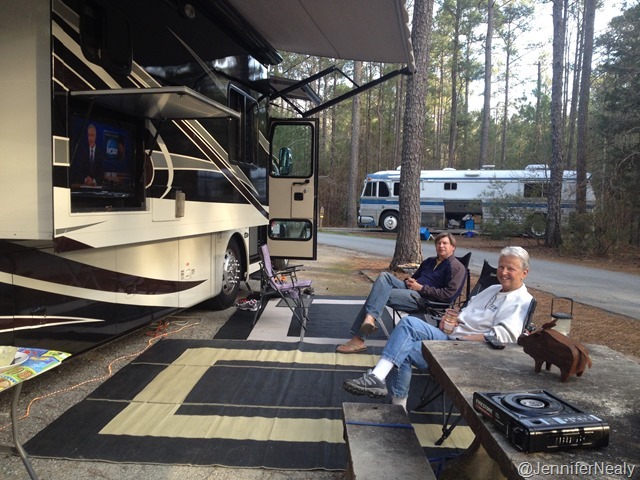 Let’s keep the RV rally rolling. Where you go, we will follow! As long as we can, anyway. Good to see you are on the road again. We are still in Cortez, FL but leave here April 1 to begin our travel north to see family before we head west again around the beginning of June. 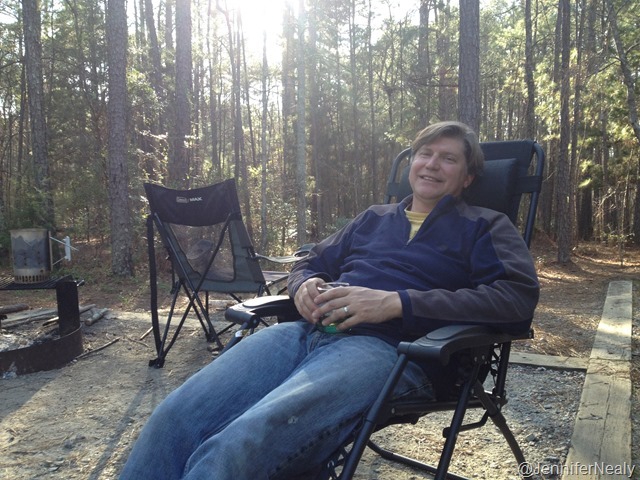 Enjoy your time relaxing with friends in the GA forest. Hope to meet up sometime in the coming months. Yes, that would be great if we could meet up somewhere! Our tentative plan is to be in Utah late April/early May, and then to head towards Yellowstone, Grand Tetons, and eventually Glacier. We’re going to let the weather dictate how quickly or slowly we move! So glad you joined us – it’s been such a fun time! I can’t imagine a better start to our trip.